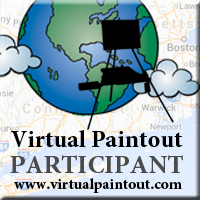 It’s time for Paint Party Friday! I made a little time for art this week. 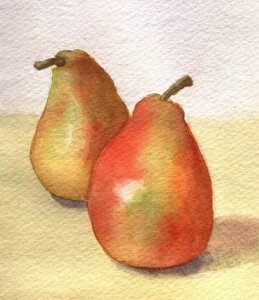 I did these 2 little pears in watercolor. The scanner always leaves an annoying glare on the light parts but it’s better than taking a photo. Cameras hate me, no matter which end of them I’m on, LOL. I’ve also showing off a little one line dog I did this week that I’m fond of. I’m really enjoying spending some of my art time doing drawings that aren’t realistic like this. It’s a nice break because you can’t do it wrong and sometimes the results have a special charm. This one is colored pencil and marker. This entry was posted in Arts & Crafts on October 7, 2011 by admin. Your watercolour pears are perfect! Your watercolour style is beautiful – I really want to learn to do it in such a delicate soft way, like that. I love your dog – he’s adorable! Your pup is awesome and the pears are just great. I haven’t tried scanning in a painting and that sounds like a great idea. Great pears and pup. Have a wonderful weekend. Melisa, your pears are just gorgeous. I like the light spot on them. Even if it’s not really in the painting. It is not a distraction to the beauty of the painting. Doggie is cute too. Puppies and Pears…perfect! Love your creative adventures from this week! I love love love the line dog. what character! The pears are beautiful, and I just love that great little dog. I love the shining pears. 🙂 And the pooch is adorable. Is it done with one line? I love your new art pieces!!! the pears are spectacular…and that cute little puppy is so neat with the style you used!!! The PEARS work is very lovely. I like that cute pup too! Happy PPF! Wow!! Gorgeous..those pears ate stunning and superb..super realistic too..love it..very beautiful! and i adore your sweet pup..he is dazzling and charming my heart as we speak! Love the pears. I had a pear phase about two years ago and know how challenging they can be… these look great. Beautiful pears – they look yummy! The doodle dog is adorable! still crackin’ me up with those cute little guys, they would make great children’s book characters. beautiful pears, too. wow you have a wide range of talent! Both the realistic and the “unrealistic” paintings are fabulous. Your pears look delicious, much better than the ones that are hanging in my tree!!! The dog is adorable, he’s git such a cute expression. 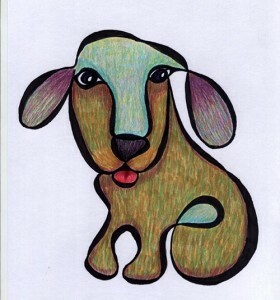 Oh your one line dog is so adorable…love it!! The pears are so pretty too! Thanks for sharing! I really like what you’ve done with this doggie! It’s my kind of style too, color pencil and markers is pretty much my main tools for all my artwork!